Police have arrested 10 more people following drug raids in Forth Valley this week. The latest arrests came yesterday when seven men, aged 35, 36, 44,27, 51, 26, 34 and three women aged 33, 33 and 30 were all charged under the Misuse of Drugs Act after officers raided houses in Falkirk, Sauchie, Tillicoultry, Killearn and Stirling. During the searches quantities of heroin and cocaine were recovered along with almost £700 in cash. 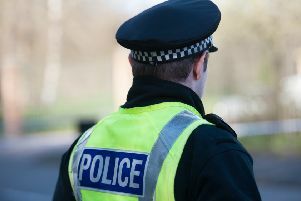 It followed 13 arrests the day before from nine addresses in Falkirk, Grangemouth, Stirling and Clackmannanshire were raided by detectives from the Organised Crime and Counter Terrorism unit and local officers. Heroin worth £13,000 was confiscated along with quantities of cannabis and diazepam from properties. The crackdown is part of Forth Valley Police’s Operation Core which started in August prioritising drug dealing, violence and road crime. Police say they have been carrying out extensive surveillance intelligence gathering in the area over the past six months and will continue to do so for the duration of the operation. Chief Superintendent John Hawkins, Divisional Commander for Forth Valley, said: “Our activity on Tuesday has been followed up by further enforcement as we look to drive home the message that drug crime and associated offences will not be tolerated in our communities. “The public have readily come forward with vital information that we have now acted upon in our relentless pursuit of those involved in the production and distribution of drugs. Ch Supt Hawkins said police are working with partner agencies like the NHS and Falkirk Council to in a bid to reduce drug crime and consumption. He added: “We have once again been supported by our partners in health and the three local authority areas within Forth Valley, whose agencies are providing essential support and assistance to all of those affected by drug and substance misuse and abuse. NHS Forth Valley, Drug and Alcohol Partnership and Falkirk, Stirling and Clackmannanshire councils all carried out activity in the targeted areas to provide specialist support and assistance to all of those affected by drugs and substance misuse. The suspects who were taken into custody are to be provided access to addiction support services and signposted to other agencies to help them deal with issues that may have led to their use of or dependency on drugs. A spokesperson for NHS Forth Valley said: “Police Scotland are key partners in the Forth Valley Alcohol and Drug Partnership and NHS Forth Valley will be working closely with them to offer support to the families and communities affected. “The Forth Valley Alcohol and Drug Partnership team estimate that for every person who has problems with substance misuse, there are likely to be two or three other people who are directly affected. “These include spouses, partners, children and siblings, as well as co-workers and friends. Families have a critical role to play in helping people on the road to recovery by engaging more fully in their recovery plan. Contact numbers are: Signpost Recovery (0845 673 1774) or Forth Valley Family Support Service, freephone 08080 10 10 11.